Martin Luther King lost his life standing up for what is right. Taking a stand for Civil Rights in the 1960s could ruin careers, too. These three stood up with Martin Luther King anyway. I hope to always stand up for what is right as well, and do it all by the grace of God. *Bonus points for those who can identify the three people in that photo. Extra bonus points for describing some of the other actions each of them took in working for civil rights. This entry was posted in Uncategorized and tagged 1963 Civil Rights March, grace, Martin Luther King Jr. Day, oppression. Bookmark the permalink. 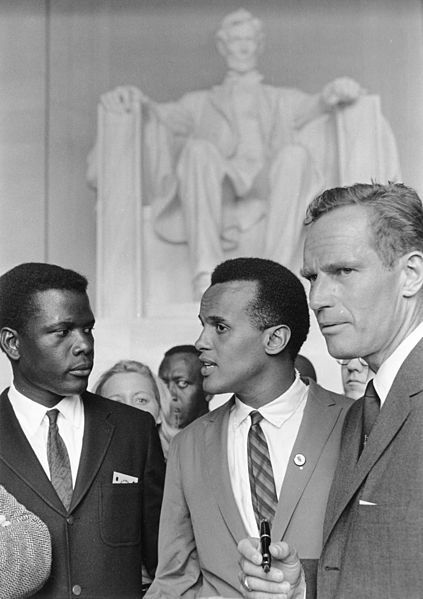 Sidney Poitier, Harry Belafonte, and Charlton Heston. I’m saving up my interweb bonus points. Good idea. You don’t want to blow them all at once.